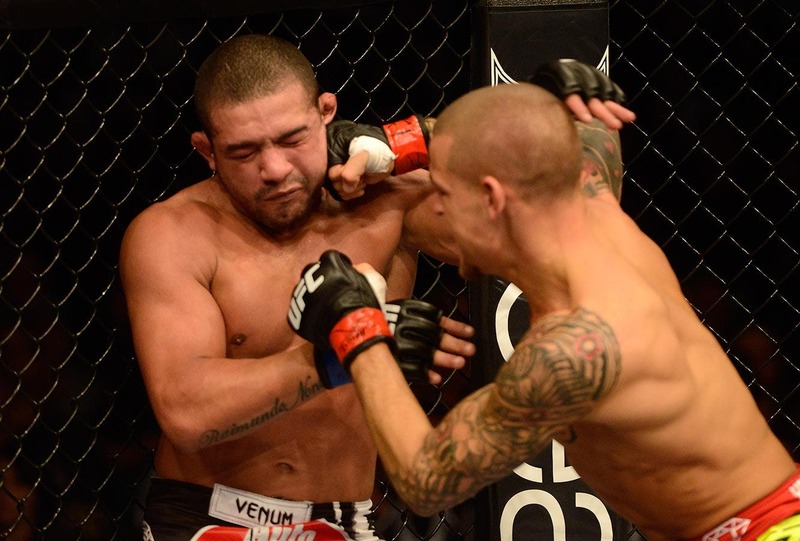 Poirier's dominant win over Brandao has propelled him into a higher profile position in the division. Dustin Poirier prides himself on being a professional. He works hard, eats right and shows up to fight night with the belief that he’s done enough to succeed. He respects his opponents regardless of what they’ve done before. But sometimes he canât help but get fired up, much the way he did after his UFC 168 opponent Diego Brandao threatened to stab him while the two waited to weigh in on the night before their match. Those words — which Brandao admitted to saying to an MMA Fighting reporter earlier this week — enraged Poirier. He thought he earned his revenge the next night, when he knocked out Brandao in the first round. That, Poirier felt, was enough to shut him up. But then Brandao started talking again. This time, he said he had been in a car crash. That he couldn’t train, and that Poirier was ‘lucky’ to have beaten him. Another cheap shot, Poirier says. This is him trying to hold on to something and make excuses. The guy’s a tomato can. "I don’t even know what to tell you," the 24-year-old featherweight told FOX Sports. "I’m done with this guy. He’s a win on my record. I’m over it. I’d love to give him a rematch. I’ll fight him 10 more times. It’d be like padding my record. It’s easy money. I could beat him all the time. I feel like I was more technically skilled everywhere the fight went. No problem. This is all talk. This is in the past for me. This is him trying to hold on to something and make excuses. The guy’s a tomato can." Contrary to Brandao’s claim that he knocked Poirier down twice, Poirier says that he was never close to being hurt. UFC record keeper FightMetric backs up Poirier, recording the fight’s only knockdown in his offensive column. Moreover, Poirier said that Brandao’s claim that he only trained about five times due to the accident didn’t hold water since they’d known about the fight almost four months in advance and the alleged car accident occurred just two weeks before the match. That might have left him compromised on fight night, but he should have had plenty of gym time beforehand. "It’s nonsense," Poirier said. "It’s just a coward thing to do, to make excuses. He could have showed up 100 percent, made weight and still gotten a beatdown. I was ready to fight and ready to win. I can’t let what he said take away from my performance." He stopped a beat, trying to regain the professionalism he prides himself on. "I’m not a trash talker," he continued. "I don’t like to talk down on people. When I said he’s a tomato can while we were talking, that’s just because he’s trying to find excuses. To me that’s what bums do." Perhaps his fire on the subject stems from the fact that he was injured in the fight and fought through it to win. Poirier was given a six-month medical suspension due to a right shoulder injury he believes he sustained while defending a takedown. He expects to have it checked out on Friday but suspects a pulled muscle. I don’t like to talk down on people. When I said he’s a tomato can while we were talking, that’s just because he’s trying to find excuses. To me that’s what bums do. If all goes well and he only requires a short rest, he hopes to be back in the Octagon around April or May. While he originally voiced a hope for a rematch with Cub Swanson, he acknowledges it’s not likely that Swanson will accept a second bout so quickly after the first, and thinks someone like Dennis Siver might make a good foil. From a purely sporting perspective the match makes perfect sense. Silver is ranked No. 7, one spot below Poirier on the latest UFC rankings. "I always have a lot of stuff to work on," he said. "It never stops. I’m trying to get better everywhere, especially with this level of competition. These guys are so good. I’m just trying to grow and get better as a fighter and a person. I don’t want to rush, and I think that timeline and level of opponent would work well for me."